Looks great, brings back memories of a great dinner at Pascal’s just a few months after Katrina. I am going to have to try this the next time I find head on shrimp. It looks amazing and makes me miss New Orleans! This looks a bit toned down from your original recipe…no beer & no thyme? Either way, I’ll try it! The recipe is in the oven right now. Thank you again Danno for this wonderful resource. How do you deal with the connotations of ‘BBQ’ as regards this dish? To many, BBQ means a grill, not a skillet. This dish looks fantastic! I truly can’t wait till my next big party to try it. Thanks for sharing it. So no heat until the skillet goes into the oven, or do you start the skillet on a flame? No mention of de-vaining before cooking…do you go ahead and leave the insides…in? Hey Phil! 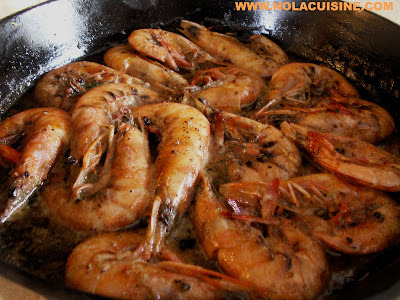 I never worry about deveining for Barbecue Shrimp.